Axis Customer Forum • View topic - AXIS Media Control - How to hide RTP Buffering animation? AXIS Media Control - How to hide RTP Buffering animation? Post subject: AXIS Media Control - How to hide RTP Buffering animation? 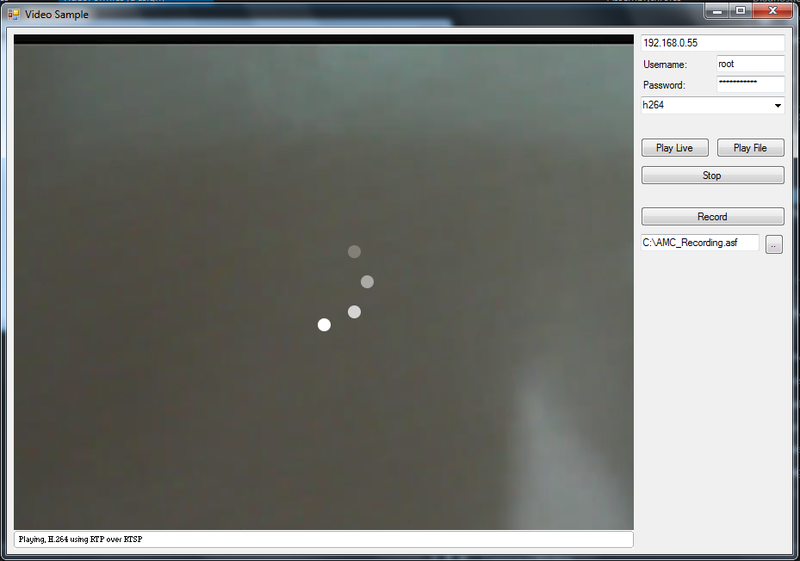 I try to testing AXIS Media Control SDK with included "Video" sample. All working good, application receive h.264 stream, render it and record. But on the center of picture always circling buffering animation. When set "DisableRTPBuffering" option to true, animation stops, but on the picture always stay dots, which not recorded to video. I try to change some settings but it not help. I attach screenshot with this problem. It's possible to hide that dots? Hi, the loading dots should not be there for normal RTP-streaming. Could you give some more details? - Have you made any modifications to the sample? - What camera model are you streaming from? Just a URL, login and password, nothing else. Everything works fine with AXIS cameras. This problem occurs with different ip-cameras that are used by customers. The SDK is only supported for Axis cameras, so can't help you with other brands. The loading dots will appear if AMC is receiving a metadata stream. So my tip is to try to modify the URL so that only a video stream is received. Thanks for the answer. I have to use the AXIS Media Parser SDK.